Yesterday I had the pleasure of exhibiting alongside some of Suffolk's and Essex's best wedding suppliers at Suffolk Wedding Shed's first ever wedding fair, held at Newbourne Village Hall. It was a fantastic event, celebrating everything fun about weddings and wedding planning. There was a wonderful atmosphere amongst the stallholders, and the sunshine even cooperated too! Here are some of the highlights from the show. Grinning my head off, all set up and ready to go. Event planners Jacqui and Shelley, really looked after everyone, and even cooked us all a bacon sandwich for breakfast (another reason to smile!). Busy busy, as everyone decorates their stands. I love the quirky post-war feel to this adorable viallge hall – just think of all the prettiness you could hang from the simple, beamed ceiling, to dress theis wedding venue! (All bunting, paper lanterns and venue dressing by Boomting Bunting). I was delighted to be next to fellow stallhoder, the very lovely Victoria Bradfield, who I always enjoy having a natter with. She is an incredibly talented Makeup Artist, and definitely worth checking out if you are yet to get your wedding makeup sorted. Just make sure to book her well in advance as she's a popular lady! My other show neighbour was Charlie of Farlie Photography. Charlie works closely with her clients to capture their connection in a beautifully light, relaxed and uncomplicated fashion. Striking, feminie prop hire, venue styling and sign-wriitng from A Little Touch of Heaven and one of my pesonal favourite gift shops – Emzo in Cotton. 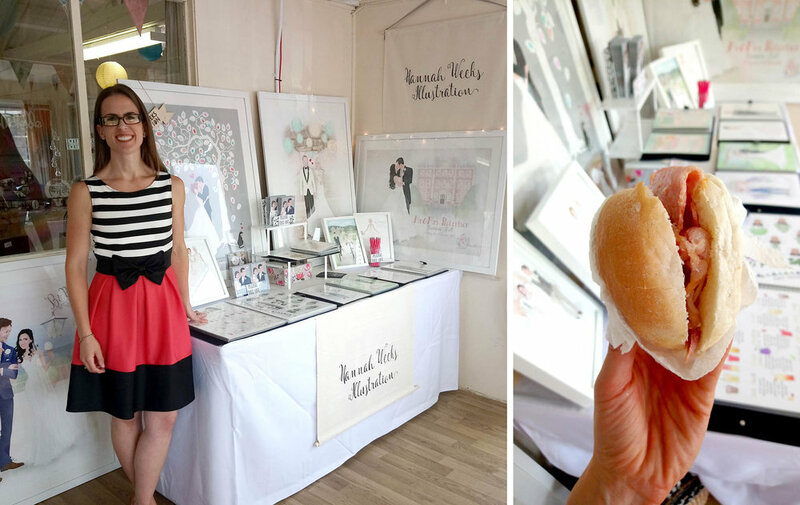 All the wedding suppliers really were wonderful – and such variety! From left to right – Bows, Rings & Pretty Things' adorable, colourpop pompom earrings; show-orgnaniser Jacqui of Wishheart Tiara Design's stunning butterfly and bees headpiece; delicate, perpex signs by Megan Cattermole Wedding & Occasion Styling. There were some wonderful food and drink vendors at the fair too. The Little Cocktail Box specialise in high quality cocktails, and I can tell you first-hand that thier signature cocktail was absolutely delicious! I was also treated to a glass of prosecco by the wonderful folk of One for the Road...it was a good afternoon! Lots of bride and groom-to-bes enjoying the show, and checking out some wonderful services on display. Another shot of my set up. This was the first time I didn't take my picture-display easel with me... if I'm honest, I couldn't fit it in my teeny car and chief car-packer Tom wasn't around to help me like usual! I think it worked well though and I actually quite like the look of having my big pictures just propped up on the table top. One last snap! The fingerprint tree went down really well and was a real favourite amongst the fair visitors. I absolutely loved being part of #TeamWedShed, and was delighted to be involved in Suffolk Wedding Shed's maiden show. I really enjoyed chatting with old friends, making new ones and connecting with some really lovely brides – I am really looking forward to working with some of them in the future. Thanks for having me Jacqui and Shelley, count me in for show number two! Newer PostHow I illustrate your portraits.